When most kids play games with their Tetra Pak juice boxes, it likely involves shooting jets of liquid out of the straw at one another – but that may soon change thanks to an augmented reality marketing campaign launching today. Now kids will also be able to use 200 ml Oasis juice boxes as a video game controller, moving them to block virtual soccer balls as part of a Web-based video game. 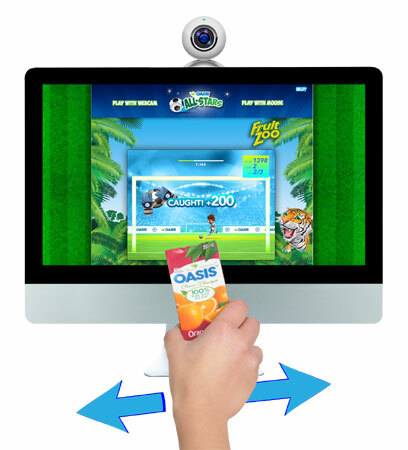 Designed by Montreal-based Augmented CPG, Oasis All-Stars uses a computer’s Web cam to detect the Oasis-branded juice box and even the flavour of juice. From there, players hold the juice box (or more technically, the Tetra Brik Aseptic carton) up and move it through space, controlling the hands of a cartoon goalie named Nico. It’s an experience similar to playing with Nintendo’s Wii motion controllers. Tetra Pak Canada sees its brand as an established home favourite, and didn’t think that augmented reality technology applied to it at first. But after meeting with Augmented CPG, marketing director Tevfik Djamgouz was convinced the idea was a winning way to engage with customers in a new way. In Oasis All-Stars, a Tetra Pak acts as the controller. Kids will talk about the game and advertise Tetra Pak products through word-of-mouth, Djamgouz adds. Tetra Pak Canada worked with Augmented CPG to develop the game concept, choosing soccer as a theme because it is so commonly played by Canadian children. It was the shared notion that casual gaming is having a big impact that Djamgouz found common ground with Mathieu Bouyrie, the vice-president and executive producer at Augmented CPG. Bouyrie explained that such games could be triggered by using packaging like a key to unlock them and interact with them. Oasis All-Stars can’t be played with any other rectangular box, or even other brands of juice that use Tetra Paks. An image calibration process basically uses the player’s Web cam like a scanner, detecting first that they have the Oasis package, and from there it detects the variety of juice. The different flavours will unlock different game modes. For example, Oasis Classic has the player stopping 50 balls in rapid succession, while Oasis Fruits Etc. triggers a sudden death mode. If players don’t have the right type of box, they can use their mouse to play. Augmented CPG is no stranger to incorporating real products into augmented reality (AR) marketing campaigns. In fact, the small firm that includes between 10 to 20 employees depending on what projects are in the works, has dedicated itself to packaging-based AR. It produced the 2009 Molson Dry campaign credited as being the world’s first AR campaign to use a real object. Beer drinkers were encouraged to hold Dry bottles up to their Web cams and see CGI effects applied to it on screen. More projects are in the works with Tetra Pak, Bouyrie says. The current Oasis campaign will run until the end of April, Djamgouz says. Tetra Pak is considering mobile app tie-ins for future marketing campaigns. One idea is to engage consumers when they’re in the store to buy products by having Nico appear on their smartphone screens when they point their camera at Tetra Paks on the shelf. The player then could interact with Nico to do certain tricks. Startup movements: Obama, Cameron...where's Harper?